I feel like it’s been a while since I connected with you on a more personal level, sharing my feelings and thoughts. Today, I thought I’d just spill my thoughts everywhere, see where this goes and give you basically a general update of how I feel about life right now. Ever since I launched Bloom’s new location and Revolution in August, it’s been well let’s say a whole nother journey for me. It really feels like I’ve opened up a new chapter of my life and I’ve just started. I think there are good sides and bad sides to every job. A lot of people tell me that I’m living my dream and that I am what every person wants to become. I feel like that’s a lot of pressure to take. I think that the grass is always greener on the other side. Yes, I am doing what I want to do but although I try to keep a strong front, there are times when you’re wondering what on earth are you doing. It feels like you’ve taken off and have started flying but there are times when you stop and look down and kinda shock yourself at how high you’ve flown. Sometimes I ask myself why I’ve done this to myself – after all, getting a 9 to 5 job is so much easier. I would finally have weekends, a steady salary, can finally plan financially and the movement of my company wouldn’t depend soley on well…me. It feels like there are eyes everywhere, eyes that yes want you to succeed and other eyes that can’t wait for you to fail – the constant pressure of having to look and be successful. It’s Painful. But in all this, I’ve really begun to discover a few things that I keep telling myself over and over again and I really hope it helps you too. Be satisfied with whatever comes your way. I’ve had classes with just one person in them (trust me I had barely any customers so yes just one, not really just a case of bad scheduling) and where other people would have told me not to waste my time, that’s still one person’s life I could still help, still one person’s life I could still change. Shouldn’t that be enough. Why do I have to change 5 at a time. If there’s 500 or one, I’m going to do it anyway. If I have to shift furniture and sweat like a dog, I’m going to do it anyway. If all odds are against me, do it anyway. Having your own business does that to you, illogical and unpractical as it sounds. So many times we trick ourselves into believing that we don’t know how to do something or we can’t. I’ve figured out my whole life by just saying yes. Even at the times when I wasn’t sure how to do something, the timeline would force me to learn it and learn it well. That’s how I’ve grown and that’s how I propel myself constantly to the next level of my life. I am a Christian and I don’t want to be someone who cowers behind it, tucks it away for a special occasion. If you’re going to say you’re something, be it wholeheartedly. Now that we’ve gotten that cleared out of the way 😉 the way I see things and my life may be a little different. I’m here for God’s purpose and plan. And sometimes I forget. I forget when the rent is a huge struggle to pay that month, I forget when there’s not a line of customers outside of my door, I forget when I’m tired and I just don’t want to do it anymore. But everytime I’m in those situations, I need to tell myself that I’m here for God. Only God. There’s this thing in Christianity where you need to fix your eyes on Jesus and when you do that, everything just fades away – all your worries, your issues, your mountains that you can’t pass. If God wants me to just teach one person today, I’ll teach her. If God wants to test my heart today, then so be it. If God wants me to learn what feeling financially tight is, then let God. God, I am yours and I need to never forget that. If God doesn’t want me to take that collaboration I think will totally propel me, then God, I will follow you. Because of where I’ve been before of having very few to like zero customers, I have brought that thinking to the present moment. 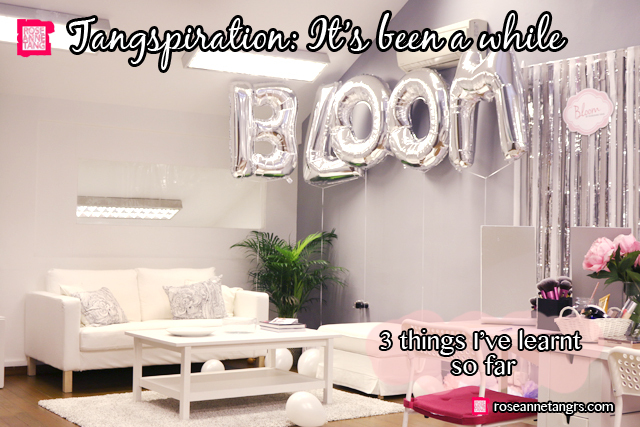 I have downsized everything – from my class size and even when I was hunting for a new location and premise to hold Bloom – I was looking at even smaller places than the present unit I’m in. I even considered shared offices, and holding Bloom in just the meeting room or co-working spaces even. But I realise, this is wrong and I need to change it. I can’t bring my past down experiences into the future thinking this..is …it. I can’t keep thinking this is as big as it will ever get. I can’t do that way of thinking anymore because I know I will never grow this way. Instead, I’ve started to think bigger, think about what I’d like it to become! For me, I hope Bloom can one day go international. I’ve taken my first step to breaking this habit by buying a $600 Ikea table the other day that expands to seat 6-8 instead of only 4. So, yay. I imagine having staff, not just myself and for that, I’d need a larger location. Let’s hope for the best. I think the biggest takeaway from this I’ve learnt is that you need to allow for the big to happen. You can’t just constrict yourself to a tight place because even if the big wants to happen, it has no room. You gotta allow for it. So yes, this has um been well circulating on my mind, creating little typhoons of thought. I hope you enjoyed this post and seemingly have inspired you in some way. I need to get ready for the day. It’s my overdue day off today (day offs are usually during the week since my weekends are full)- well kind of. I have a work meeting in the morning to go to – but after that it’s off to my aunt’s place for lunch and a movie and dinner with my Dad! Beautifully written, Roseanne and straight from the heart! God Bless you and give you strength in all you do. Love, Karen (from a Starbucks in England)! Please don’t give up. its a very noble dream and i think God has blessed you with good education and a supportive family. stay strong! Truly enjoyed my session with you today and I think you are such an inspiration. These are such truths when it comes to business but hardly anyone shares them – often only showing the rosy side of things. I love that you’re thinking big. I love that you don’t allow these set-backs to knock you down. I’ve had my fair share of doing business (but unfortunately with people who didn’t have passion into the business) and retreated to a 9-5 job in the end (well, let’s hope when the boys get bigger, I’d be able to kick start a dream again). Wishing you all the best and success and that you’ll need a larger location in time to come! Wow thank you dear! Enjoyed helping you out with makeup as well 🙂 wishing you the best!